By design, a motion offense is supposed to be free form and interpretive. That does not mean it should be random or hap-hazard. Here are some quick hitter entries you can use to enter into your motion. A quick hitter is a play with one pass and maybe one or two cuts that are designed to get your scorer an open, early shot. When finished, it will leave your players in good position to continue your motion offense if you don't get that early shot. These cuts can be run out of any set and generate any motion. The sets that I have used here are solely because they had to be illustrated somehow. You should adapt these plays to sets and offenses you are comfortable with. 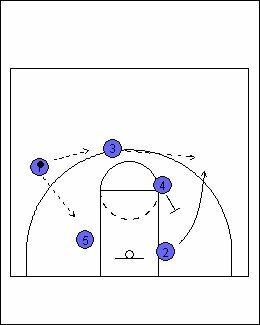 2 cross screens for 5, timing it so 5 arrives at the block as 1 brings the ball to the wing. Offense then continues into motion offense. 1 cuts off stagger screen. 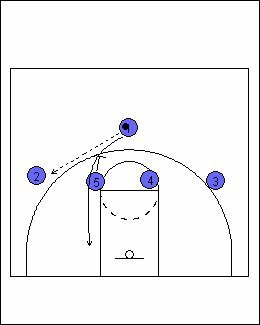 4 steps up to ball screen, timing it so he arrives to screen as 2 is catching the ball. 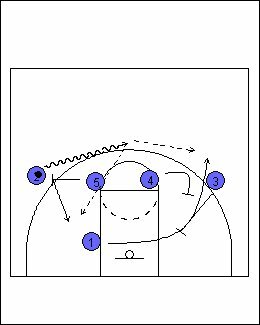 3 steps out to ball screen for 1. 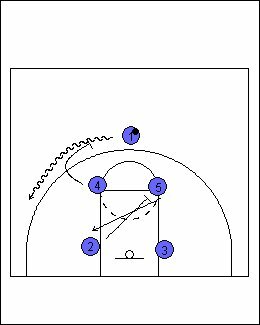 Immediately after ball screen, 5 flare screens for 3. 3 cuts off flare screen. 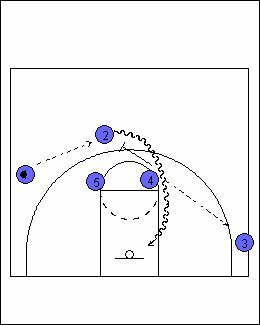 In each of these quick hitters, players space out to appropriate spots for the type of motion offense (5-out, 4-out, 3-out, 2-out). I'm the Varsity and JV boys coach at the Qingdao No. 1 International School of Shandong Province in China. Last year we ran a motion offense using cutters off of the high-post. This year I have several new players that can shoot well from the outside, so this motion offense will be great for my team! Thanks for a simple, well spaced, flexible plan with good options...This is exactly what I was looking for in a motion offense. 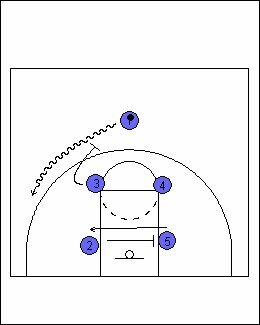 In UCLA shouldn''t the 2 look to hit 5 off the screen and roll? @Ange - The pass from the 2 to the 5 is a difficult one to make - unless the 5 slips the screen if his defender hedges too high....I have found that if the 1, instead of cutting off the double screen on the weakside, pops to the strongside corner, and then rises out of the corner to the wing as the 2 comes off the 5's pick and roll/pick and slip, the 2 can reverse the ball back to the 1 who has a much better angle to deliver the pass to the 5, who would seal his man (or even better, the 2's defender if he tries to go under the screen) and get a good low post feed for the 5 to go to work. 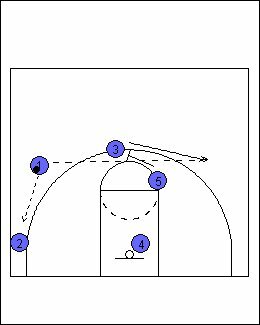 On the weak side, those players can interchange, screen away for the shooter coming towards the 2 for the jumper, or position the shooter in the high post, and set a fade/flare screen, with of course the screener then diving down the middle for the wide open bucket. There are many good options here!!! 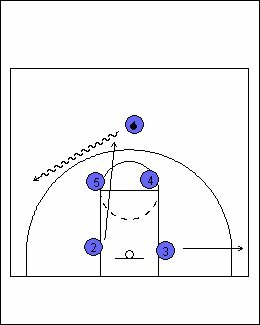 Looking for Quick hitter plays with a two guard front, and one post player. I am an OLD SPURS fan (90 next month) who left San Antonio to be near kids (in their fifties!) in Dallas. I have an NBA pass so I can watch my beloved SPURS. I am alone new (lost hubby of 67 years) this year. Just wanted you to know that I am adding a new dimension to my viewing "skills" through your Breakthrough Basketball. Sean Elliot is good at explaining plays but the action is very fast--now I can study plays in print...and continue to learn about a game I love. The motion offense is works best against which defense. 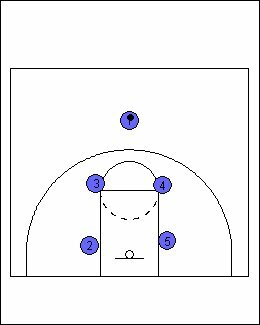 2-3, 2-3 Zone, man to man etc. And what drills are best to run to teach youth about the motion offense. I have a ton of stuff out of 2 guard set with one post player. Thank you for the plays, they are simple but very effective! one more option to the UCLA play (i know these are quick hitters but just thought i would throw it out there for you). 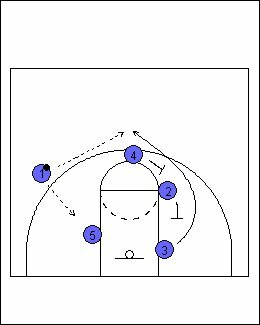 After 2 passes to 1 off the double screen-4 and 3 can then double screen across the lane for 5. This i accually to a T the offense we run from time to time that i think was put together by Rick Majarus at Utah. give us more quick hitters! Any advice for a first-time coach. I am helping out my dad with his non-profit we just finished softball and now we r doing basketball. It's my first time coaching this age group (15-17) any advice ? I take it your dad has some experience doing this. Follow his lead, become a student of the game and learn as much as you can. The kids will know right away IF you know the game or not. IF you have coached before then you are still ahead of these kids... make sure it stays that way. Know what your dad wants to accomplish and works towards that goal. As for the kids themselves, treat them fairly and with respect, they are almost young men now. Let them know that you care about them, more than just as a Bball player. When there are 2 coaches its kind of a good guy / bad guy relationship. Listen to them when they have complaints or problems, explain to them what they need to do to solve the problem and let them move on. Remember that you are the assistant and your dad is the head coach, you need to be loyal to him even if you disagree with something. You can always talk about things after practice and give some suggestions, bottom line, he still makes the final decisions. NEVER let the players see that you disagree with him. I appreciate the advice but I''''m the head coach and my nephews my assistant coach my dad is just a head of the organization but I just don''''t know which direction to go as far as coaching is concerned as for my nephew he does have some experience as well in the game but neither of us have actually coach this age group before I have coach basketball before but I coached a much younger age group I believe it was 4-6 . But that was some time ago. I'm not sure what you are looking for? Is this an AAU team or? What are your goals for these kids? If you are talking DEFENSE... I'm a m2m advocate and OFFENSIVELY If I were you (and these kids have any talent at all) I would run an Open Post motion... keep it simple. There is a lot more to the game than that .... inbounds plays, how to break presses, full and half etc. We can give you a lot of suggestions but If I were you I would go to the high school coach and ask for help. Or maybe one of his assistants could help you. Set some goals for the team - then make sure you make some good practice plans so you can achieve them. Again, talking to someone in person can help you a lot. Good luck and IF you have some specific questions, fire away. From what I gather talking to them a couple times during sign up every kid wants to be the playmaker on the team and are extremely cocky about their game. How can I find the right position for each kid. They all have talent but from watching them play a couple times they lack in the fundamentals. But they are eager to learn. I guess what I wanna know what would be a good way to start practice and what drills will benefit them the most and improve their game. Growing up I had a great coach who passed away not too long ago and he is who I went to for advice on my softball team but given the situation I can't go asking for advice and trying to remember all the drills the benefit me the most growing up isn't as easy to remember as I thought it would be. That's ok, what you have to do is sell them on the fact that even Mike didn't win until he got the rest of the team involved. Phil Jackson did a great job of selling him on this. We always used this at the beginning of the year - hold your open hand out.... and ask them IF they would have more power hitting someone with that (the make a fist) or this? The open hand is the individual and the closed fist is the TEAM. Together, EVERYONE Achieves MORE!! You can search the net for all sorts of motivational sayings around teamwork. You already identified some of your problems, FUNDAMENTALS... that has to be your first goal. As you watch them, write down everything that you believe needs improvment, then that goes into your practice plans to make them better, IF you cant pass, catch or dribble the ball, you cant play. If you look at the left side of this page, there are many sections that have drills, offenses, defenses etc. You will find a lot of drills in the Player Development section. I hope this helps you. If you need more info just ask.